Shown are the LPG gas bottles, pigtails, changeover valve, regulator and the gas line into the home during a tanker refill. New to Home LPG? You Are Not Alone! 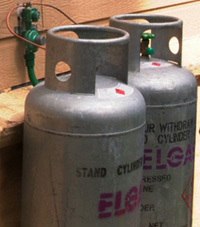 LPG is stored under pressure as a liquid in a gas bottle. It turns back into a gas when you release some of the pressure in the gas bottle by turning on your appliance. A regulator ensures a consistent pressure is safely delivered from the gas bottle to your appliances. How many LPG gas bottles do I need? 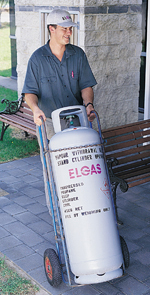 We provide most NZ homes with two 45kg Gas Bottles. With two gas bottles, you call to order as soon as one bottle is empty, while continuing to use the other bottle. This gives you an uninterrupted supply of gas. Please see How Many & What Size Gas Bottles Do I Need? How are the gas bottles connected to my home? 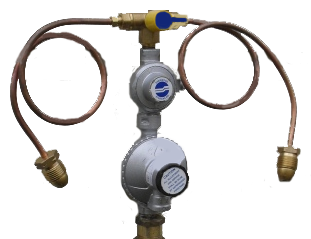 The gas bottles are connected by tubing, known as “pigtails”, to a changeover valve and the changeover valve is connected to a regulator. A gas line then runs from the regulator to your appliances. The changeover valve controls which gas bottle is in use. Who provides the regulator, changeover valve & “pigtails”? The property owner engages a licensed gas fitter to install the gas regulator, changeover valve and the “pigtails”. The gas fitter also connects the gas line from the regulator to your appliance(s). These components and the appliances are the property of the homeowner. Elgas owns and provides the gas bottles. If you just moved into a home that already has LPG, all of this would have previously been done. You just need to select from your LPG Gas Delivery Options. What is a Gas Fitting Certificate? 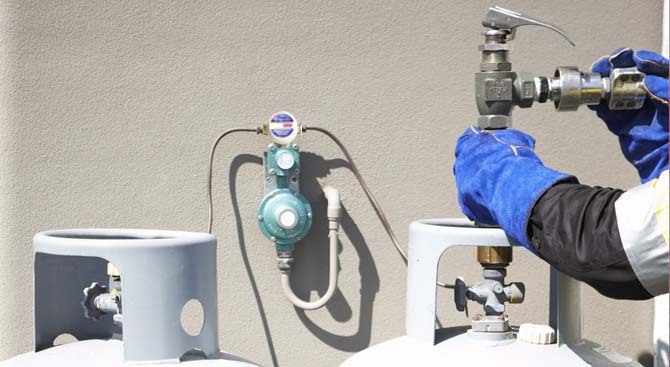 Before getting connected, the installation of your appliances and the gas plumbing must be certified by a gasfitter registered and approved by the NZ Plumbers, Gasfitters & Drainlayers Board. How do I operate the gas bottle changeover switch valve? Several types of automatic changeover valves are available. All use a visual indicator to show you when a gas bottle is empty and it has switched over to the other gas bottle. The indicator typically turns red when the first bottle is empty. Do not touch or turn the indicator. When it turns red, that’s your signal to call 0800 435 427 for a delivery. We will replace the empty bottle with a full one and reset the indicator. How is LPG gas delivered to my home? 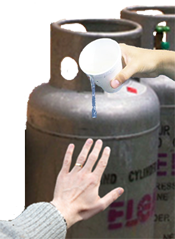 With our Gas Bottle Exchange Delivery, we deliver filled LPG gas bottles to your home and remove the empty gas bottles, as you use your LPG bottled gas. You simply order when one LPG gas bottle is empty and we will be there with another full gas bottle. We detach and attach the gas bottles for you. You get Automatic Text (SMS) Gas Check Alerts to remind you when it's time to check your gas bottles, based on your past usage. You'll never forget to order your gas bottles. Text orders and Gas Check Alerts are an Elgas exclusive! 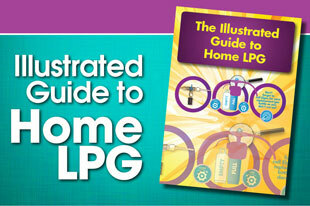 How do I order my LPG gas? To start, you Set Up a New Account Online. It's fast and easy. You can Order Your Exchange Gas Bottles Online, including special instructions, confirmations and scheduling information. Call us on 0800 435 427 and speak with one of our friendly Customer Service Team. Use Text (SMS) To Order Your Gas Bottles at any time with any mobile phone and get a Text (SMS) confirmation. You can also place an order by simply forwarding a Gas Check Alert back to us. Only from Elgas! Use our Automated Telephone Ordering with any telephone keypad. What if there are already gas bottles attached to my home? First, you just Open a New LPG Gas Account Online. Then you simply order gas when you need it. If the gas bottles are from Elgas, we just exchange the bottles. If the bottles are from another supplier, we will remove the old bottles when we bring you your full gas bottles. We also return the old gas bottles for you, at no charge. You can just sit back and relax while we handle everything! How do I pay for my LPG gas? Please see our Payment Options page for your various choices including Bpay and online payments. How do I make sure I don't run out of gas? Always order gas as soon as the first bottle runs out. Don't wait until the gas bottles are both empty or near empty. Follow this advice and you are virtually assured to never run out of gas. Remember to check your gas bottles more often in cold weather or when you have additional house guests. Remember to order sooner, rather than later, during the busy winter season. If you only have one gas bottle attached to your home, you may wish to consider adding a second gas bottle. This is particularly wise if you use it for hot water and/or heating. Make sure we have your Mobile Number so you receive Gas Check Alerts™ by Text (SMS). Remember to increase how often you check your gas bottles if you install additional gas appliances. Be certain to tell us if you install additional appliances, especially if you are on automatic tanker delivery, so we can adjust your delivery schedule. How do I know how much gas is left? Carefully pour a cup of hot water down the side of the bottle and a line of condensation should appear at the level of the remaining gas. 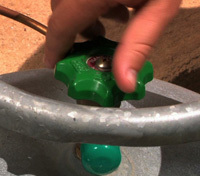 If no line is apparent, you can also wait a few seconds and run your hand down the cylinder. It will feel cool to the touch at the level of the gas. If you see no line and feel no difference in temperature, chances are the bottle is empty. Remember to always use care with the hot water. Also, please be aware that gas bottles are designed to be full at 80% or just over 3/4. The bottles are oversized so you get the full measure of gas. The unfilled space, called "ullage", allows for the natural expansion of the gas during warmer temperatures. How often should I check my gas bottles? Hot water only - Every 2-3 months depending on climate and the number of people in your home. Heater only - Every month during heating season or more often with large or multiple units and in colder climates. Combinations of the above - Every month or more often during heating season with large or multiple units and in colder climates. How long should a gas bottle last? How much LPG will I use? What if the gas isn’t working? Check to make sure the active gas bottle is turned on. The active gas bottle is the one pointed to by the changeover valve. Check to see if either gas bottle has any gas left, using the hot water test. If so, you may need to switch to the full gas bottle with the changeover valve. If both bottles are empty, please contact us for a gas delivery and make sure you tell us you need 2 gas bottles. What if there is a gas leak? In the unlikely event that you have a gas leak, turn off the cylinder valve(s) by rotating clockwise. You should also call the Elgas emergency response number on 0800 435 427. As an added precaution, make sure the area is well ventilated to disperse any gas, and remove or turn off all flames and other sources of ignition.